Living: Beagles are small enough to fare well in an apartment but enjoy their time in the outdoors as well. 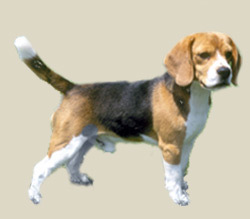 One of the most amiable hounds, the beagle was bred as a pack hunter and needs companionship, whether human or canine. It loves to explore the outdoors and is an enthusiastic trailer. Given adequate exercise, it is a calm, tractable house pet. It is an excellent child"s dog, gentle, incredibly tolerant and always ready to join in a game or an adventure. It is an independent breed, however, and may run off if a trail beckons. It barks and howls. The beagle needs daily exercise, either a long walk on leash or a romp in a safe area. It can live outdoors in temperate climates as long as it is given warm shelter and bedding. It is a social dog, however, and needs the companionship of either other dogs or its human family; as such, it is usually happiest if it can divide its time between the house and yard.